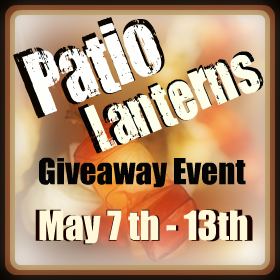 The Patio Lanterns Blog Hop Giveaway Event has arrived and will run from now until May 13th midnight where we will celebrate Mother's Day and Days on the patio. After you enter my giveaway, head over to the hosts This Lil Piglet, Tales of a Ranting Ginger and Sober Julie combined giveaways with over $475 in prizes and then make sure to click on all the participating blogs in the linky below to enter their giveaways too. Win some great prizes for Mother's Day! Here at Tales of Mommyhood, Baby Banz has very kindly donated a prize for my readers!!!! We all know how important sun safety is now, and protecting our kids from the Suns harmful UV rays is always top priority for me. I don't want to keep them from outdoor play, but being sun smart is definitely a necessity. Baby Banz has a number of items to help with sun protection. I had the pleasure of reviewing the Banz Sunscreen Travel Kit last year - you can check out my thoughts on it! Baby Banz will supply the winner of this giveaway (USA only) with a combo pack (bucket sunhat and banz sunglasses) in the colour of their choice (provided it is in stock). To enter, use the rafflecopter form below (giveaway open to the United States only) and don't forget to visit the rest of the blogs below to enter their giveaways! i'd get navy star for my baby boy! the green tide hat with key lime sunglasses is cute and gender neutral too. pink diva camo looks cute!